In addition to presenting live in class using Doceri, you can create screencasts from your Doceri project whether you’ve created it with annotations over a PowerPoint or Keynote presentation, or if you’ve developed a hand-drawn presentation from scratch. One of the most frustrating things about screencasting has been narrating simultaneously while creating or annotating a presentation. Using Doceri’s exclusive timeline-based editor, you can screencast live, or you can create the presentation first, complete with stop points along the way. Then, when the presentation is just how you want it, you’ll record the audio narration while controlling the timeline playback - all right from your iPad. Pause as many times as you need to – you can even create multiple screencast videos and combine them later. Everyone Needs a "Do Over"
Create as many different screencasts as you need, based on any Doceri project. The project itself remains intact no matter how many different screencasts you create or delete. You can even create multiple screencasts from the same project, or different projects, and easily combine them into one video. As a professional, you need control over where your content is posted. Doceri screencasts are created as standard high quality video files. Share your screencast directly to YouTube or Facebook if you choose, send it privately as an email attachment or save it to your Camera Roll. You can also transfer a screencast to your computer via iTunes. 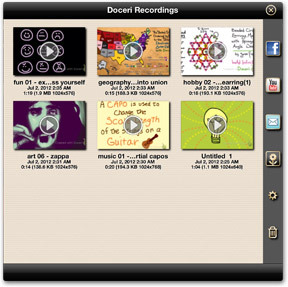 Doceri Screencasts can be uploaded to learning management systems, imported into iMovie, Adobe Premiere and other video editing software, or incorporated into iBooks Author. How will you Flip your Classroom? Create next week’s geography lesson at home, on your iPad, and post it directly to your Facebook page or YouTube channel for your students to view before coming to class. Edit that same and add ideas for discussion to send to your student’s parents. At the end of class, send the whiteboard home with your students – capture an image of the board, including tomorrow’s homework assignment. 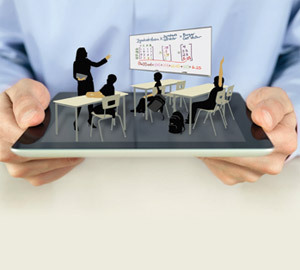 Record your math lesson live in class as you present with Doceri connected to your classroom projector, and afterwards, post a screencast of all the equations you and your students worked out step by step. You’ll even be able to back up through the equation and add annotations to show where errors were made.